There are few things I like more than a soft pretzel. A soft pretzel ROLL, though? That’s taking soft pretzels to a whole new level of glory. Crusty, chewy, glossy, deep brown covered with coarse pretzel salt, a soft pretzel roll is the ultimate vehicle for any sandwich you fancy. Have you ever had a hamburger on a pretzel roll? Ungh. So good. For me, though, the apotheosis of sandwich-i-tude is a soft pretzel roll split in half, piled high with shaved smoked ham, blanketed with a thin slice of Swiss cheese, the top half of the roll, then shoved into the oven just until the cheese has melted enough to hug the sides of the roll and run down onto the pan a bit. A hearty squirt of spicy brown mustard and a side of coleslaw makes a lunch worthy of the most beloved diner. But you get bonus points because you can eat it in yoga pants and bunny slippers and a really tatty ponytail. The truth is, you can skip the sandwich filling and just throw a bunch of mustard on top… I won’t tell. These are big, round, soft pretzels. If you weren’t tempted, I’d wonder a little. Were you to divide a pretzel roll and smear the inside with Nutella? Well, all I’m saying is that you wouldn’t regret it. Here’s what I’m driving at, friends. Soft Pretzel Rolls are happy food. They make everything just that much better. Boy, do they. You need these in your life, pronto. Don’t panic when you see the length of the recipe. It is only that long because I’ve included three options for mixing up your dough: by hand, by stand mixer, and by bread machine. 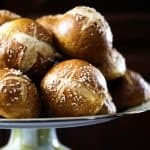 Everyone needs soft pretzel rolls regardless of what kitchen gear you own. EVERYONE. 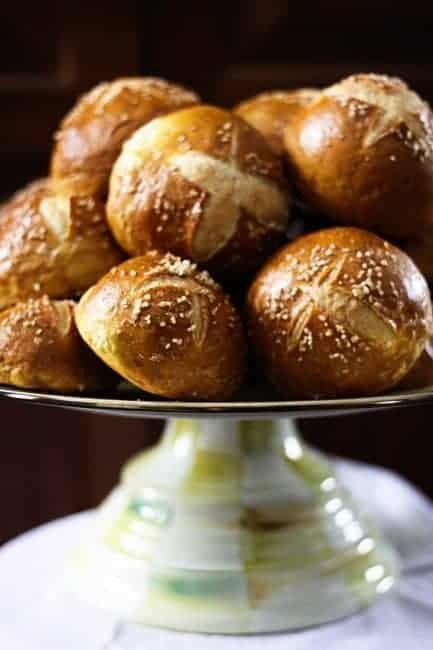 Crusty, chewy, deep brown, salty Soft Pretzel Rolls are the ultimate in sandwich bread. Servings 12 Sandwich sized rolls. Line a 11×13-inch baking sheet with a silicone or teflon pan liner. Alternatively, use an unglazed stoneware pan. Set next to your work area. Turn the dough out onto a very lightly floured surface. Use a bench knife to cut the dough into four pieces. Cut each of those quarters into 3 pieces. Working with one piece at a time, form the dough into a ball, then cup your hand around the outside of the ball and roll clockwise until the top of the roll is perfectly smooth and the dough is tensely stretched over the top. Transfer the dough balls onto the lined baking sheet, three to a row. They will expand both as they rise and again as they boil and bake. When you have dealt with all the dough, cover the pan with a tea towel and let rise in a warm, draft-free place until puffy looking, about 20 minutes. Preheat oven to 400°F. Bring 2 quarts of water to a boil in a stainless steel or other non-reactive pan (enameled cast-iron, tempered glass, etc…) When water boils, add the baking soda. Gently lift the pretzel rolls one at a time into the boiling water. (You can boil more than one at a time, but be sure not to crowd the the pan as they will expand as they boil. Let simmer for about 45 seconds, flip the pieces and simmer for another 45 seconds-1 minute. Use a slotted spoon to drain and return each piece to its place on the pan. Continue until all rolls have been boiled and returned to the pan. They will look a little puckery and shriveled. Do not fear! This will all work out! Brush all of the rolls with the frothy egg white and sprinkle with coarse salt. Use a sharp knife or lame to cut an x 1/8- to 1/4-inch deep. Place pans in oven and bake at least until golden brown, about 25 minutes, but you can bake until they are deep brown as I prefer them, closer to 35 mintues. It’s up to you! Remove the pans from the oven and transfer the rolls to a cooling rack. Cool completely before slicing and serving. You can cut the dough into 24 equal sized pieces for slider sized rolls, if you prefer. Thank you for the step-by-step photos. The “boiling” always seemed a bit daunting. Definitely on my weekend list of fun. Chandler will be so excited! I seriously want to dip these in a vat of melted cheese. Like right now. MMmm momma I’m with you girl. There aint nothin’ like a warm soft pretzel slathered in mustard..or nutella or honey and peanut butter! Thanks so much for the bread machine version I don’t know what I would do with out my bread machine! Hi it’s me again ; ) After following you on IG, and Twitter…today I finally took the time to ck out your blog! I just wanted to say I am so so so very sorry I waited so long to stop by. 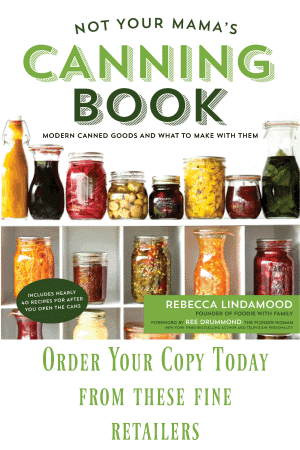 After after perusing around I’ve found a new favorite blog ; )……and are you a Michigander too?! 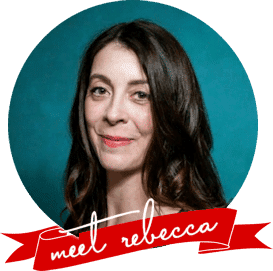 You write for the T.C. Record Eagle. Do you live UpNorth?! I’ve made these before, they rocked. I wouldn’t say they were “soft”, so I’m going to give yours a whirl. They look so inviting. I’ve pinned them and I’m putting them on my list of things to make SOON! Thanks for the three mixing options too. These look so yummy! I have a quick version of this recipe using frozen Rhodes Dinner Rolls. You boil and bake bite size pretzel bites and then brush them with butter and sprinkle with kosher salt and parmesan. They never last more than 2 minutes! I’m weak in the knees. I could happily eat a whole heck of a lot of these. These look so delicious! I should not be reading your blog while I’m so hungry. Ditto all the above. Especially for the one who voted cheese sauce. Will have to try these very soon. Just out of curiosity -how many batches of these do you make at once and do they freeze well? 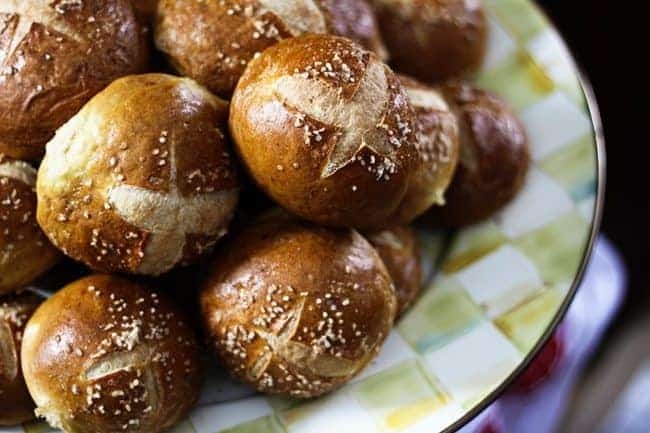 The two times I made homemade pretzel rolls (knots, actually) they were glorious! Leaps and bounds above store pretzels, etc. These are gorgeous. I am frantically trying to think of where I can get a preztel roll for lunch..drool! Wowzers! You weren’t joking when you said you were obsessed with pretzels. I am really impressed with this recipe. And I will have to use it for my research. Delicious research! I think my husband may write to thank you if I make the sandwiches you described. I am thinking that I like the way you boiled these, and of course your use of the malt seems like a really key element. I will keep you informed as my testing goes, and I’m sure I’ll have more questions. These just came out of the oven, they were amazing!!!! Turned half into rolls and half into pretzel sticks with cheese and green chilis. No cheese explosions in the water when boiling. Filled 2 with cheese and chilis, but it was a bit messy to roll, so for the rest i sprinkled the chilis on after the egg & salt. Will be making these again- it is great you get a snack while you wait for your dinner to finish cooking. Thanks so much for the recipe. these look great! can i prepare these and freeze them to use at a later date, before the boiling step? I imagine that would work fine. Most dough does. I assume that you asking that means you know how to thaw and proof properly! I’m assuming from the rest of the comments that this will be deleted. These were AWFUL. Like, gluey, burnt, just generally awful. I can’t even suggest any fixes other than finding a vastly different recipe. I’m not a troll, I swear, but I lost several hours of my life and several cups of bread flour attempting these. Yuck. I was not in your kitchen while you baked these, so unfortunately it’s hard for me to try to isolate what went wrong with your attempt. If they were gluey, they could have been over or under proofed (or your yeast could be dead), you may have crowded the pan while boiling, they may have boiled too long,… it’s just hard to say without having been there. I am sorry it didn’t work out for you like it did for the other folks in the comments who have had great success with it and enjoyed it.